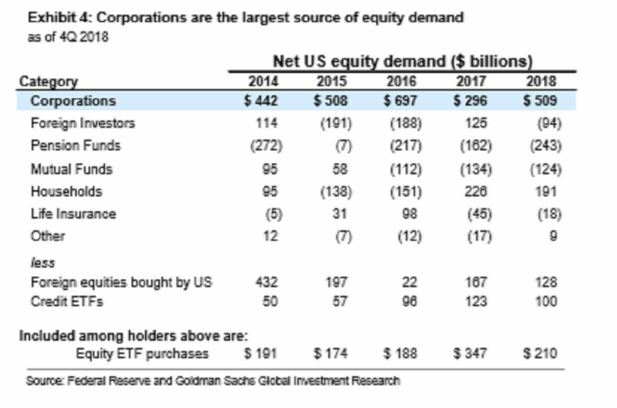 An interesting recent report from Goldman Sachs shows that share buybacks have been the largest source of U.S. equity demand during the last five years. Apparently, since 2010, net corporate buybacks averaged $420 billion annually, compared to only $10 billion each from households, mutual funds, pension funds and foreign investors. According to a Bloomberg report, Goldman studied stock performance during earnings blackout periods, when discretionary buybacks are restricted beginning about five weeks before a company releases earnings, and then for two days afterwards. During the past 25 years, return dispersion and volatility during blackout windows have been higher compared with non-blackout periods: 16 percentage points versus 14 percentage points, and 16.4 points versus 15.8 points, respectively. Meanwhile, since buybacks have bolstered earnings per share by reducing the total stock outstanding, blocking repurchases would hurt growth in EPS. Over the past 15 years, the gap between EPS growth and earnings growth for the median S&P 500 company averaged 260 basis points. According to Goldman Sachs “In a world without buybacks, forward EPS growth could be trimmed by 250 bp,” a reduction that has historically corresponded to a 1 point decline in forward price-earnings multiples. This entry was posted in Assets on April 10, 2019 by Phoenix Investor Relations.